The elderly head of the Ushiromiya family, and the owner of Rokkenjima. Kinzo holds his children in contempt, viewing them as vultures ready to feast on his inheritance as soon as he dies (or at least when word of his death spread out). He rarely leaves his exceedingly vast study, which contains various commodities such as a bed, lavatory, and bath. He is also a rabid practitioner of black magic and the occult, his shelves lined with volumes upon volumes of grimoires. One of his most prominent obsessions is Beatrice, a witch he is said to have summoned and contracted for ten tons worth of gold. He is deceased by the beginning of the series, having succumbed to a long-time drinking habit. 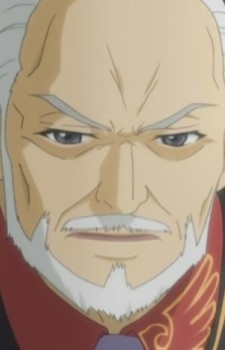 However, his oldest son Krauss, Krauss's wife Natsuhi, his personal physician Nanjo, and all the mansion's servants (except for Gohda) maintain the illusion at the family conference that he is still alive, albeit with a three-month life expectancy; any interactions between Kinzo and any other characters are meant to sell the deception to the reader regarding the true events. Throughout the first four games, Kinzo's body frequently turns up burnt in the incinerator of the mansion's underground boiler room as a means to conceal how long he had been dead, and is identified as Kinzo due to his polydactyly, distinguished by having six toes on each foot.